There are six miniature house designs in each of the products in this series. The designs use a single color, either black (or another dark color) on light fabric. When stitched individually on 14 count fabric, each house design finishes to approximately 2"x4" and fits perfectly in a 5"x7" precut mat. 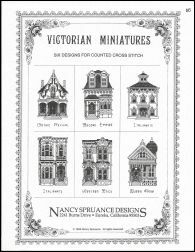 The Victorian Miniatures chart pack also contains an "add-on" chart of 7 lampposts, 12 fences, 3 gates, 3 urns, and 2 alphabets for creating house pictures and street scenes of your own. 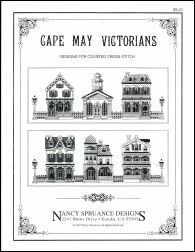 The houses in the Victorian Side Streets, San Francisco Scenes, and Cape May Victorians leaflets are each charted in two street scenes. 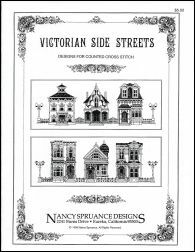 Victorian Side Streets is a fixed design derived from Victorian Miniatures. The houses, lampposts, and fences in both San Francisco Scenes and Cape May Victorians are all new. The house designs and "add-ons" are all to the same scale so that you can mix and match a wide varieaty of your own scenes by combining elements from different products. 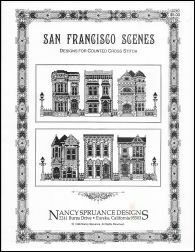 For ideas on how to add color to your own Victorian Miniatures house designs, see the section titled "Coloring your Miniatures."